As you read this, Susan and I are on our way to the south for the tenth running of the Honda Indy Grand Prix of Alabama at Barber Motorsports Park, just east of Birmingham. We have an added guest joining us this year – our friend Paul Dalbey drove to Nashville yesterday and is riding with us. After all of these years, Paul is going to experience Barber for the very first time. It’s hard to believe that this weekend will be the tenth running of the Honda Indy Grand Prix of Alabama. Not to brag, but Susan and I have attended every single one of them, in addition to attending the Spring Training event at Barber Motorsports Park in March of 2009. It was there that I fell in love with this little gem of a race track and was hopeful that the NTT IndyCar Series would start racing there, since Nashville had lost its IndyCar race the previous year. The following year, in 2010, the first Honda Indy Grand Prix of Alabama took place. The naysayers said it would never work in the heart of NASCAR country. After all, Talladega was just a few miles to the southeast of the track. They also said that Indy cars on this track would be a parade, because the narrow track was originally built to be a motorcycle track. There could never be any passing. Ten years later, it is one of the favorite spots on the schedule for teams, media and fans. There is a charm about Barber Motorsports Park that I have only seen replicated at Road America. I’ve never been to Mid-Ohio, but I hear that it also comes close to rivaling those other two in the charm department. After the first race everyone raved so much about the beautiful facility, that the term beautiful facility became a punch line. While I’ve joked about it myself, the term really applies. Show me another race track that winds its way amongst tall pine trees, blooming dogwoods and azaleas. If you are standing on the road that encircles the track and overlooking Turn Two – you look down to see the track as I’ve just described, with manicured flower beds and steep elevation changes. If you look straight out, you see the majestic Alabama countryside for miles in front of you. Off in the distance you see the rolling hills that are just small enough that they can’t be called mountains, but they still create a very picturesque setting. You almost forget you are at a racetrack until you hear and see a car screaming out of the pits and coming toward you in Turn Two. Not only is the scenery at Barber Motorsports Park memorable, so is the southern hospitality. Being a native southerner myself, I know that not everyone who visits the south experiences southern hospitality. Some say it is a myth. There are times when I might agree with those who say that, but the volunteer and paid-staff at Barber make sure that everyone feels welcome. Barber is always the race we attend before the Month of May in Indianapolis. It’s a stark contrast between IMS and all of the tradition, pressure and crowds that come with it – and the laid-back, refined atmosphere we always encounter at Barber. The only things the two places have in common are the cars and the drivers. The 2.34 mile, sixteen-turn layout has hosted nine NTT IndyCar Series races since 2010 that have been pretty much dominated by Team Penske. 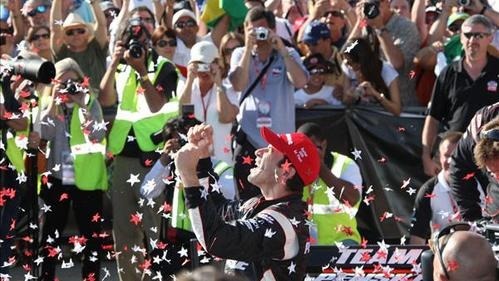 Helio Castroneves won the inaugural event, and Will Power won the next two – meaning that the first three races were won by The Captain. Then Ryan Hunter-Reay won the next two for Andretti Autosport, before Josef Newgarden won the first of his three Barber wins for CRH Racing in 2015. Then Simon Pagenaud returned Team Penske to Barber’s Victory Lane in 2016, before Josef Newgarden won the last two in 2017 and 2018 for Penske as well. So out of the nine races run thus far at Barber, six have been won by Team Penske, two by Andretti Autosport and one by the team now known as Ed Carpenter Racing. If you’ll notice, one of the big teams was missing from that group – Chip Ganassi Racing. Scott Dixon finished second in the first four races at Barber from 2010 through 2013. In 2014 and 2015, he finished third. In 2016 he slipped up and finished tenth, but by 2017 was back to finishing second again for a fifth time. Last year he finished sixth. On one side, you think he is certainly due; but the other side says the racing gods are against him ever winning at Barber. Since this is the tenth running, please indulge me as I post these two photos from the very first race at Barber in 2010. 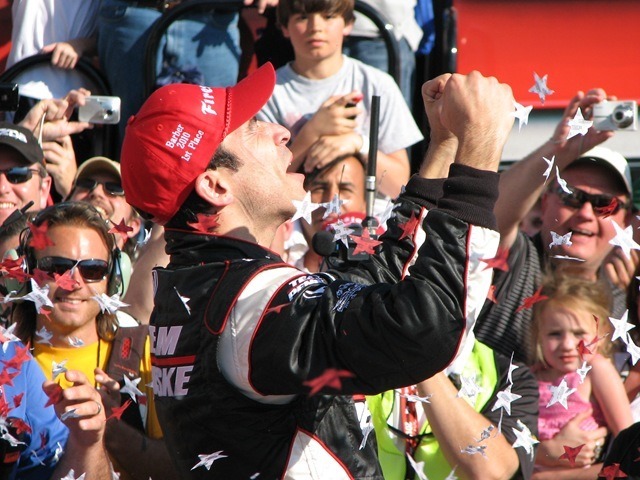 The first picture was one I took of Helio Castroneves celebrating his win in Barber’s Victory Lane. The second photo was on the IndyCar website the day after the race. If you look closely, directly beyond Helio you can see me taking the first photo, with Susan beside me with a much smaller camera than she has now. One other thing that Barber shares with IMS is rain. I’m not sure that I can remember a single race weekend at Barber that it didn’t rain at some point. There have been sunny days at the track that had severe thunderstorms at night. That was the case three or four years ago and it turned the grass parking lot into a quagmire. Susan had gone back to the car on Sunday morning before the race to get something. On her way back, there was a car stuck in the mud. She joined a couple of others that were trying to push the car out. The driver gunned it and threw mud all over her white shirt. She was not happy. In 2014, the race was shortened due to a race day downpour and Hunter-Reay was declared the winner. Last year, conditions were so bad during Sunday’s race, that they postponed it to the next day. Unfortunately, this weekend looks no different. There is rain in the forecast for Friday morning, and storms forecast for Saturday afternoon. The Sunday forecast seems to be improving, so maybe at least the race will be unaffected by rain. But that won’t help the parking lots. Common sense would say that Josef Newgarden and Team Penske will win on Sunday, and that may very well be the case. But in celebration of the tenth running of this race, I’m going with someone that has come so close, so many times to win the race – Scott Dixon. As usual when we are in attendance at a race, we will be posting several times throughout the weekend, so please check back often. And as usual, you can follow us on Twitter for photos and videos. You can follow me at @Oilpressureblog or Susan at @MrsOilpressure. Although I don’t know how frequent he’ll be posting – also check out Paul Dalbey’s site, Field of 33, listed on my blogroll to the right. Keep your fingers crossed for a dry weekend and please check back later. This entry was posted on April 5, 2019 at 4:03 am and is filed under IndyCar. You can follow any responses to this entry through the RSS 2.0 feed. You can leave a response, or trackback from your own site. Still kinda blows my mind that the races are always so entertaining at this track. Narrow, twisty, only one real passing zone, yet it’s usually one of the best races of the season and has become a favorite. I’ll make the trip south one day to see it with my own eyes. I’ve driven it on the sim several times and it’s a real rollercoaster of a track that keeps you on your toes at all times. I’ve been several times and can confirm that Mid-Ohio is very charming, even quaint. It’s a true old-school track and is in the middle of beautiful Amish country. Have fun! Just watched the first practice and saw that the grounds were not as lush. I don’t think I remember why the race was moved up to before LB.